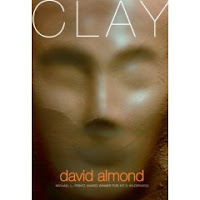 Clay by David Almond. Copy from library. The Plot: Davie is an altar boy, living in a small town in England when he first sees Stephen. Before this, it is a typical boyhood; a flirtation with a girl at school, a best friend, a rivalry with the kids from the next town that is a self described "war". But after Stephen arrives, a strange boy living with Crazy Mary, things change. Stephen makes things out of clay. And says he can make them live. Are they alive? Davie is drawn to Stephen, to this power he has, and other things fall by the wayside. The pretty girl, his best friend. But the war with Martin "Mouldy" Mould only escalates. Stephen's answer? Create a man of clay to take care of Mouldy. The Good: I adore David Almond. Straight up, let's get that out of the way. Love him. Love his books. So of course this gets onto my Best Books of 2006 list. OK. On with the good. Almond writes dialect; but it's not heavy handed. From the first "bliddy hell" I could hear these boys voices, the voices of their world, and I really want to listen to this on audiobook. I'm not a fan of books with dialect, because often heavy use of dialect separates me from the story. Here, I may not know what clarty means when I read "Great clarty footprints all through the hall" it thrills me, nonetheless. Another bit I loved: "the air outside seemed filled with angels." I adored Davie's family; Almond has created a warm, loving family, very likable, which contrasts all the more with the danger in Davie's life. What is he getting himself into, the conflict with Mouldy, the relationship with Stephen, the man they may or may not create? Why is he making these choices? Davie is Catholic; he believes in miracles and the miraculous and this story is set at a time when one may start to question those beliefs. Enter Stephen, with proof of miracles; proof of good and evil. And Davie believes; believes in Stephen's power, even when he sees Stephen create and destroy and treat people like toys. Believes because he sees these things. Stephen pulls Davie into his world, saying that Davie can create, also. The only thing we need to make a real man, Stephen says, is the consecrated wafer and wine. I still get chills as I remember this passage; will Davie commit this ultimate sacrilege? And for me, this choice, and what Davie does, and why, is the heart of the book. In addition to questions about belief, there are also questions about creation and responsibility (AKA the Frankenstein issue). Is Davie is mad or dreaming? Is this real? And if it is real, now what? What should this man of clay do? "Nothing means he'll crumble back into the earth. Nothing'll be the end of him." Links: The Gail Giles review. LOVED this book, too. I reviewed it as well, but the review is the tail end of a post with about, oh, five or so other reviews above it. Anyway, love Almond, too. Has he ever written anything bad? I think not. Iv just read this book and loved it! Im writting an essay on it, and for once, I don't mind!